There are 127 posts in this thread, and it has been viewed 34315 times. There's also files attached. Hi, its time to shift your brain into "puzzle-gear" as this weeks HSC is Puzzle Bobble. *multiple runs as training is of course allowed. Also if you manage to surpass your previous score then just post it and I'll update the first post. * No cheating with any kind of UNI-BIOS is allowed. * Photographic proof is not needed as I believe that we are all honorable people. If you like though you can attach a photo or a mini-clip with your highscore. *state which platform you played this game on. 2. 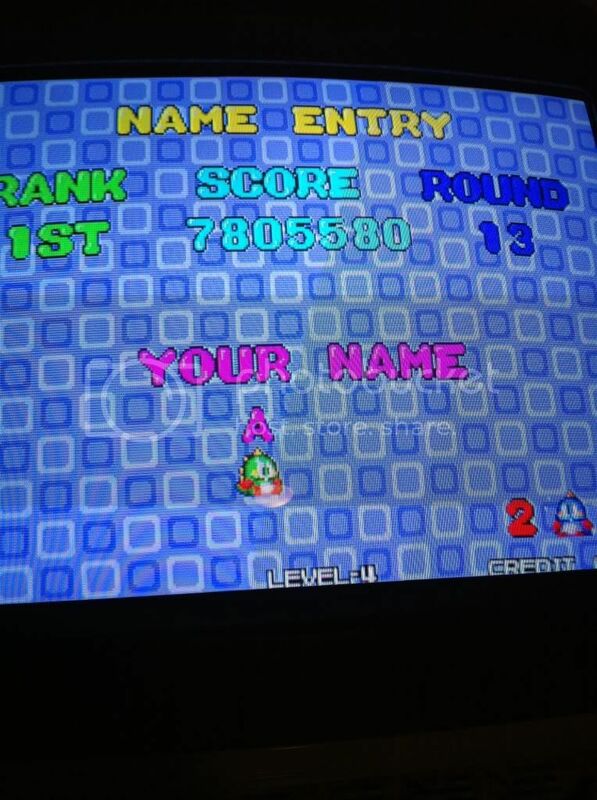 NEO-GEO Man Score: 6,629,030. , Played on Euro BIOS AES console, completed all 30 levels. Wow, let's see if me and others can get past all 30 rounds in one go. Yea this can also be a speedrun challenge if you make it through the complete game then post the time it took you doing so and I�ll post it as well as your highscore. I�ll remove my highscore from the scoreboard for the time being. Maybe its not "polite" for a mod to grab the first place first of all? We don't mind if you're first Priest! but I will happily sacrafice myself for the sake of NG4L high-score challenge! Hi Priest - Just loaded Puzzle Bobble up - is it MVS difficulty setting? I just have easy, normal, hard and mvs settings. I have reached Round 25. My high score is 3,253,790. And my total time is 845 seconds added up from each round. Rounds 25, 26 and 27 where you see a phoenix in a star galaxy background and the columns are pretty purple and transparent, are always the main problem for me. The faster the galaxy flies, the faster the bubbles get pushed down. 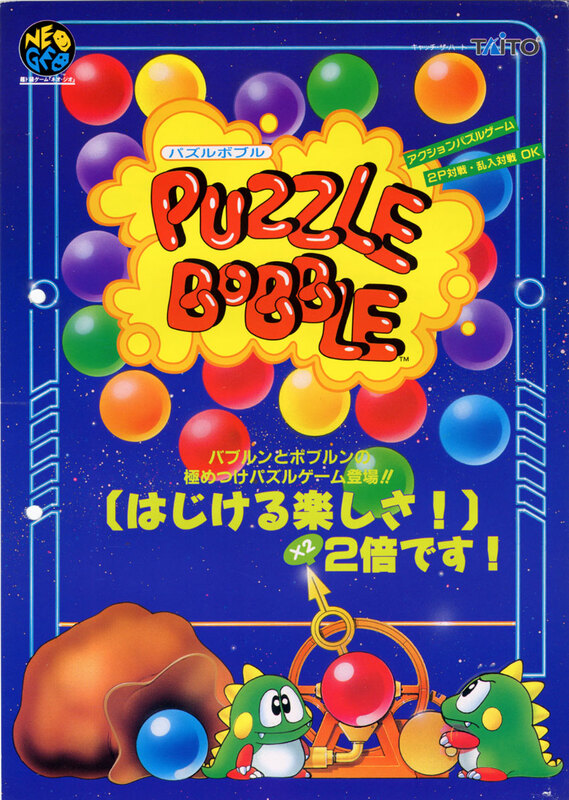 The SNES version of Puzzle Bobble unlike this version has two games, the puzzle mode and the battle mode. In the battle mode its just like the 2 Player mode except you have to battle and win twice against old "Bubble Bobble" opponents like Monsta, Baron von Blubba etc. I would like it if I could add the SNES score to this one. Well done Will! - a LOT better than I did - I got 237530 died on Level 8 - I like to think I am making it easier for people - by purposefully (ahem) getting a rubbish score. I'm not good at this kind of games but i can give it a try sometime. Zakatek: You know there is a saying: "practice makes perfect"...Give it a try! Scoreboard and Hall of fame, now updated! haha - my Puzzle Bobble MVS is the worst condition cart ever - its not my fault though. I don't know what the previous owner did to the poor thing - it has marks all over it and the label is in shred - it is really shoddy. I really find stage 8 hard still - I haven't quite got my brain round this game yet. Scoreboard and hall of fame is updated. Well done Merlin - Yes level 8 is tough, Level 6 is also a hard one too. Whats the music like on the CD version? - I really like the music on the AES/MVS version but it just goes on and on and on - aaaarrrrgh! I was wondering if there is a more varied soundtrack on the CD version? Riko: Sorry I missed your updated score. Scoreboard and hall of fame updated. Emulator, mvs level 4. 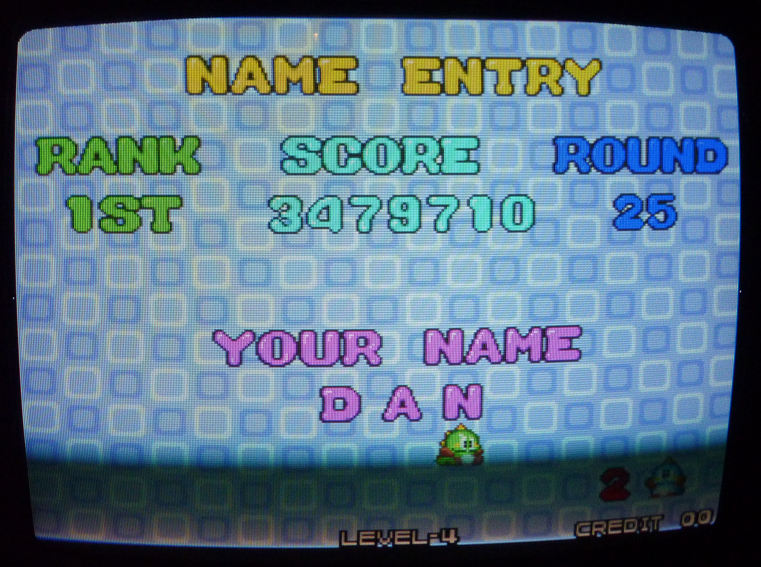 Round 16, score 2,740,790. I guess not bad for a beginner. I don't think I've shared my strategy but here goes. 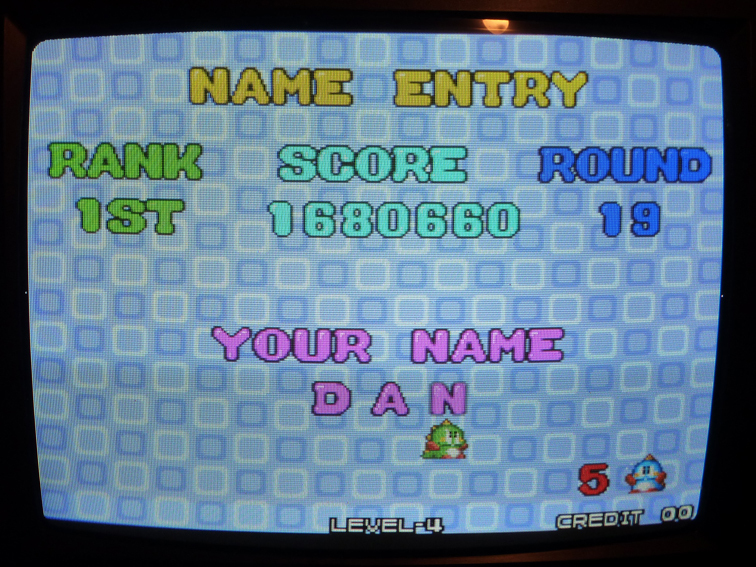 Whenever I play Puzzle Bobble I have the habit of pausing the game with the pause command so that I measure and line up my shot. That isn't really cheating, because its just pausing and taking your time (not game time, real time). I don't know if you can pause in the AES and MVS games but most certainly not the arcade games. Of course the strategy guarantee I'll get to the end, because I get those kind of problems, all the coloured bubbles except the one I need the most before late. Would you take advantage of the pause command or would you just keep playing?